We have been visiting Lake Powell regularly since 2003 – the area is just breathtaking. However, years of drought have left this reservoir on the border of Utah and Arizona less than half full. Lake Powell is crucial for both water and electricity. Some 20 million people drink water from the reservoir. But 14 straight years of drought have done a number on Lake Powell’s levels. Lake Powell was at 94% capacity in 2000. Between now and then, all but three years have been years of drought. The reservoir will probably top out at around 51% of capacity in 2014. Lake levels are likely to drop even more over the next few years, perhaps reaching 3,536 feet (1,080m) above sea level, or 164 feet (50m) feet lower than a full pool of 3,700feet (1,128m) above sea level. To get a sense of the amount of volume lost in that sort of drop, consider that Lake Powell covers 254 square miles (658km2). As of May 21, Lake Powel was about 117 feet (36m) below full pool, at 3,583 feet (1,092m) above sea level. As to the U.S. Department of Interior the unregulated inflow volume to Lake Powell in water year 2014 was 96% of average, which was significantly higher than inflows observed in 2012 and 2013 (45% and 47%) of average, respectively. Snowpack in the Upper Basin Colorado River was a whopping 208% above normal for June. This was good news for the boaters as they had to cruise in shallow water for the last couple years. Low water levels even closed the Antelope Point marina for some time. Even with water on the rise through early July, lake levels are nearly 30 feet below the 50-year average. On November 10, 2014, the Department of Interior will conduct a high flow experimental (HFE) release from Glen Canyon Dam in accordance with the High Flow Protocol. Releases will be maintained at peak release for 96 hours. 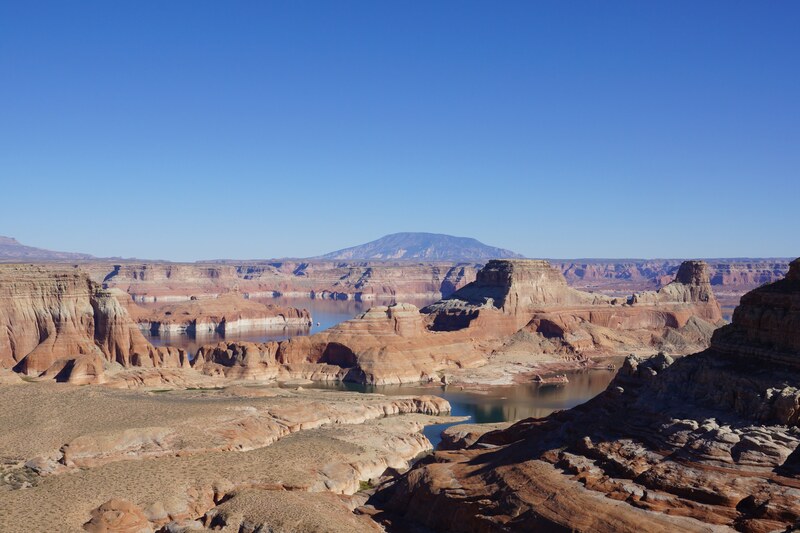 The elevation of Lake Powell is expected to decrease approximately 2.5 feet during the 5.5 day experiment. However, the annual release volume from Lake Powell will not change as a result of the HFE.